This is a great handle bar tape and I love the extra cushioning it gives. It really cuts sown the road vibration compared to other handle bar tapes. This is thick tape...I have carpal tunnel, riding with hand numbness is a given for me. I have an aggressive riding position.This bar tape helps alleviate some of the hand numbness and fatigue so I can ride longer with less pain. Like all contact points, its a personal preference. Western Bike Works has a great price on My favorite bar tape. Lizard Skins handlebar tape very cushioning and high quality. I have it on my road bike and am very happy with it. Easy to wrap. Feels good and has not slipped. If you ride roads that are less than smooth, this 3.2 mm thick bar tape helps dampen the vibration and shock. Very comfortable, good looking and provide a nice thick grip - especially if you have 31.8 mm bars. A bit difficult to put on as the material is very thick and not very stretchy, but worth the effort. This is absolutely the best bar tape I have ever used. The comfort and grip is as good as claimed, but what blows me away is the durability. I put over 5000 miles on the first set of tape. Im up to 3000 miles on the second set and it shows virtually no sign of wearing out. Sure it might cost twice as much but if it lasts 2-3x as long it represents great value. This is the only tape Ill use from now on. The most expensive tape on the market and definitely not better. It looks all pretty when you put it on and feels great but DOES NOT LAST! Even when applied properly ... LS is very specific to not stretch the tape when you apply it because then they have an excuse for their crappy workmanship. In about 10 rides, the outer layer started peeling off and continued to do so until I couldnt stand it anymore and took it off. No other tape I have used (and I have used a lot of others) does this. DO NOT BUY unless you just like to spend 40 bucks and re wrap your bar tape every other month. Usually you spend more money to get a better product but this stuff is nothing but expensive JUNK! This stuff is expensive. Too expensive for what it delivers. On the plus side it's easy to wrap and will stretch a little to cover the bends and it is easy on the hands. On the con side the stuff doesn't last. In no time, with normal use the outer layer of the tape starts decomposing. I've wrapped 2 bikes twice with it but never again. Avoid at all costs. I ride long distances (70-100 miles) a ride. The extra cushion really feels good from the beginning to the end of the ride. 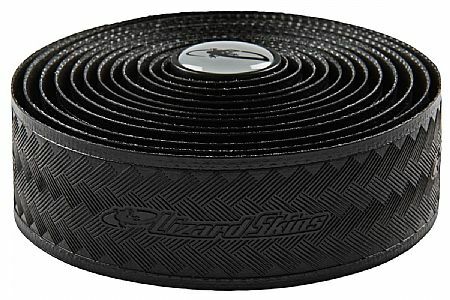 I've used Lizard Skins bar tape for 3 or 4 years on multiple bikes. It's lasted really well for me. Great product. First bar tape I ever put on by myself. It was really thick but I got the hang of it fairly quickly. I love this tape! It is absorbent to poor road conditions ( I live in the country) and it is so easy to grip! My hands and wrists were so much happier after a 30 mile bike ride...what a difference! I also appreciate the bright color. I ordered bright blue and loved it. So I ordered Bright green for my other bike! This tape is well worth the money. The 3.2 thickness helps absorb road chatter and provides excellent grip. I love the color of mine (bright green) as well as the extra padding. Took off 1 star because it is not significantly more padded than my 2.5mm ones although the way they advertise it, youd think it was much more padded. In fact I cant even tell the difference unless Im holding my different tapebar setups back to back! As with all DSP I love the feel of this tape in dry and wet conditions. I bought the thickest version as I have osteoarthritis in all my finger joints, back and neck. Great grip, shock absorption and worth the money. Lizard Skins from Bike Tire Direct was a great value on sale. By far this is the best white bar tape on the market. Cleans up easy and lasts whereas its competitors wear quickly picking up soiled marks and looking grungy. Spend the extra money and get Lizard Skins! This 3.2 tape provides a cushy ride for my gravel bike. Cushioned but still allows good control. Not a fan any longer. I was a big fan of this tape at one time (especially after the 3.2 mm came out), as it is nice on the hands. However, long-term durability is not great, after a season or two, the colored outer layer starts to peel, leaving the tape looking shoddy. Any color other than black tends to get dirty quickly, and getting the dirt off is difficult to impossible (I recently tried to clean a friend's red Lizard Skins tape using Rock N' Roll Miracle Red degreaser, this stuff normally cleans most anything, but it didn't work at all on this tape). Given that MSRP is now $46 a box, I won't be using it any longer. Fizik tape is more durable and cheaper, though not as cushy. Supreme comfort and just grippy enough. I have problems with my left hand going to sleep. This tape goes a long way towards solving that, especially on those lonely chip-n-seal roads in rural California. In addition it has just the right amount of grip and is very easy to keep clean. The thicker version takes care of vibrations while providing a solid grip. I put this tape on my cx bike and my road bike. Nice sticky texture on the surface.